What are the Advantages and Disadvantages of Using Acrylic paints? Whether you want to diversify and expand on what you already use or want to find an ideal paint for a beginner, knowing more about this paint can help you decide whether you want to try it. Acrylic paint for artists commonly comes in a tube, much like oil paint. Larger containers may be tubs or bottles for people making a large number of paintings or very large works. It is a fast-drying paint made with pigment suspended in an acrylic polymer resin. Because acrylic paint is water-based it dissolves in water rather than special substances. 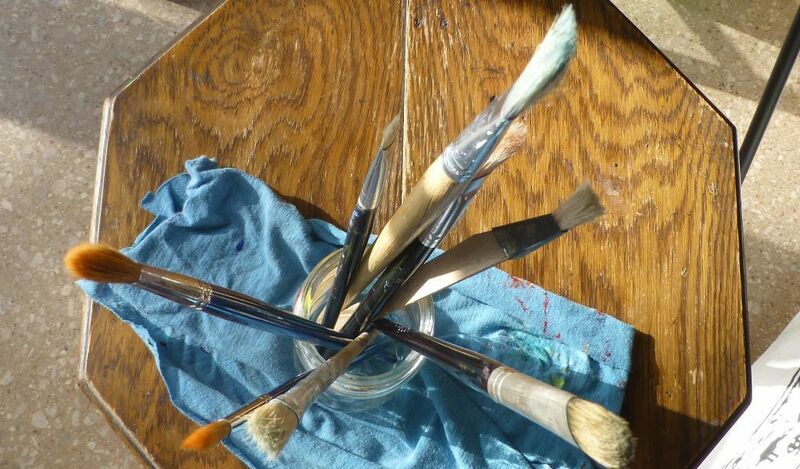 It’s much easier to clean up after a painting session than oil-based paints, which need oil or turpentine. You can soak your brushes and clean your hands in plain tap water rather than having to use flammable and smelly chemicals. Read more about disposal in our article which answers this question: Should I pour diluted acrylic paint down the drain? Acrylic paint was developed as a water-based alternative to conventional oil paints and can be used in a similar way, especially if gels and other mediums are used with it. • Outlines acrylics are non-toxic and are allergen and odor-free. This means that toxic substances will not be absorbed when you get it on your skin and when it is disposed of it will not poison the water or land. However, pigments in some professional grade paints sometimes do contain toxins, such as cadmium oxides. Care should always be taken when disposing of paint products. Acrylic paints can achieve a similar look to oil paints and give an oil-paint-like impression, and do so in much less time. The most obvious advantage is that acrylic paint dries much faster than oil paint and is ready for further over-painting in a short time, being generally ready to sell or transport overnight. Artists with a tight deadline find fast drying times essential when working on a painting that needs to be ready to ship on time. Depending upon how much the paint is diluted with water, the completed painting can resemble a watercolor or an oil painting. There are techniques, which are available only to acrylic painters, and there are also limitations that apply only to acrylic painting. Painting in acrylics can be as different from oil painting as watercolour painting is different from oil painting and a lot of fun can be had exploring its unique properties. Although Acrylic paints can be watered down with water, they are water-resistant when dry, and can be totally water-proof in some circumstances. This usually depends upon the painting surface used and the thickness of the paint. Protecting surrounding surfaces from splashes and spills is desirable. 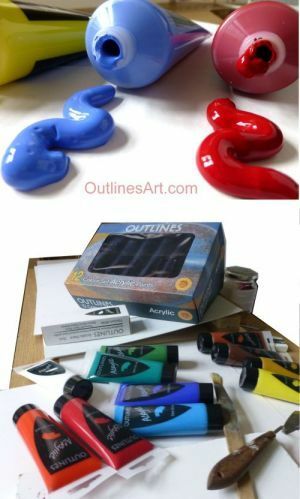 Acrylics paints can be used in place of watercolors and can be helpful for beginners wanting to paint in a softer style. There are differences; acrylics dry closer to the wanted color, usually somewhat darker, while watercolors dry lighter and typically give unexpected results. The lovely transparent layering typical of good watercolours can be achieved with acrylic paints. One of the disadvantages is that acrylics are available in fewer colours, there’s no denying the remarkable color variety of oil paints and the subtlety of watercolour. Another is the fact that when used thickly acrylics dry to a glossy, smooth finish. However they blend well and huge range of colours can be mixed, and again, additives and mediums can be used to change the final texture. Some consider this a disadvantage, and it can be if the paint dries too fast. In normal conditions our paint stays workable long enough to complete a session but temperature and atmosphere do make a difference. Bear in mind, dried paint can be painted over the top and the painting completely altered, if desired. As mentioned already, once dry acrylic paints are water resistant and they can be very difficult to remove from absorbent surfaces such as carpets and clothing. Brushes and tools need to be cleaned quickly and often to remain usable. Shiny metal pallet knives are more redeemable when covered in dried-on paint, but scraping them back to their original state can be tedious. Will link to article about cleaning up.